When a band undergoes a major shift – whether it be a stylistic one, a lineup change, a change in home base location or otherwise – there’s liable to be fears of creating confusion and-or a disconnect from established fans. People have to get accustomed to whatever the new factor at hand is and that might take time. The likes of Long Island’s Like Minded Criminals are at just such a crossroads, as established fans of the three piece have known them as Colorblind. Here in the beginnings of 2017 however, the grunge / alternative rock group decided to take the dive into new territory, to coincide with the the release of a debut full length record titled, Drowning in Bed (independent, 2017). While a small sampling of the album reveals some Colorblind-beloved tracks – albeit freshly recreated (“Burn It Down,” “Right Meow,” “High and Dry”) – the rest of the 11 track debut is hot off the ProTools presses, all by way of VuDu Studios, Mike Watts (The Dear Hunter, O’Brother, Dillinger Escape Plan), and Frank Mitaritonna. The whole album comes out tomorrow, 4 March, but to tide things over until then, the titular themed single, “20,000 Leagues Below The Sea,” is here exclusively, 24 hours ahead of schedule. Check out the stream below! It doesn’t take long into the gently ascending three note introduction, to pick up that “20,000” is a rock ballad. This might seem like an odd way for Like Minded Criminals to open their first chapter of renewal, given that the majority of the rest of the record very much resonates with the heavier rumblings of Queens of the Stone Age, Soundgarden and Royal Blood. Yet, since change is what’s on everyone’s minds, showcasing some variance with “20,000’s” restraint falls right in line with the momentum of the moment. Stylistic preference of hard or soft aside, an immediate pleasant takeaway from breaking out a ballad first, is allowing listeners to really hear Preller’s vocals and get a fleshed out sense of the work put in by VuDu Studios. Preller’s own delivery of course, can’t be fully formed by any engineer and little things like his crisp enunciation, often set aside in Like Minded Criminals’ more intense affairs, gets to shine (I know I’m drowning but I’ll show / grace under pressure). A second method of creating subtle recurring intrigue comes through the song’s primary melody. The ballad character of this track gives it a defined tune for singing along and with that, there is a degree of “predictability” that comes in tow. Not having heard the track before, there are times one can hum along and match where the track travels because there is a logical sense based on chords and the available choices for easy-to-follow movement. However, this is not the case through the entirety of “20,000.” In fact, some places where melodic flow should be of the utmost most foregone conclusion is actually where Preller throws out a twist. Scale based writing, wherein the melody is progressing along in a step-wise manner, either up or downward, acts like a magnetic force here but sometimes the expected resolution note falls either to a different “voice” or sidesteps it altogether (e.g. around 1:33, the upward half step doesn’t come from Preller but shifts to the subdued vocal harmony). This approach appears again with an augmented 4th dropped into an otherwise standard major scale descent and then a third time at the end of the bridge vocals (If you’re still listening) when Preller puts an extra step between two notes in his melody rather than opting for a leading tone suspension and resolution, which would be a classic move at that point in the track. These examples alone, force listeners to keep their hands on the wheel so to speak, and not assume they know everything that’s coming, even if “20,000” does open the doors to many pop / alternative rock ballad tropes well broken in by the likes of Green Day, circa the applaudable “American Idiot” era (Note the contemplative marching band snare pattern in the bridge:“One more drink and I’ll be gone/ I’ll write another song / If you’re still listening / If you’re listening, Oh God”). Kira: Let’s start with the obvious need for congratulations, which are definitely in order! It can be daunting when getting down to the wire on any major release, let alone one that has so many other aspects of change attached to it. Emotionally speaking, where is the band at right now, knowing you’re all but standing upon show / party time? Eric: I’m generally just pretty stoked to go on tour and promote the album, I personally didn’t have the emotional rollercoaster of making the album that the rest of the band had. Kevin: I personally am pretty stressed about getting ready for tour and making sure everything is going to go well, but i’m also relieved that the album is done and I can finally stop worrying about it. Anthony: Excited, happy, eager, READY! Kira: Since the change is brand new and it hasn’t yet been asked, this question is ripe for the asking: Why the name Like Minded Criminals? Kira: Does the birth of Like Minded Criminals feel like a completely new creation and transformation or, more like that of a drastic evolution from the days of ColorBlind? Eric: I wasn’t really in ColorBlind for too long before the change, however in my opinion it’s definitely more of an evolution than something completely new. Anthony: I feel like its a completely new band, thanks to ColorBlind. Kevin and I laid the foundation but the feeling is completely different now with Eric in the band. Kevin: I also agree with Anthony It feels to me more like a whole new band. Our “Aesthetic” is completely different now. Kira: How, if at all, have your musical motivations changed as a group, in so far as what you want people to hear, see, feel, and remember, when listening to these new songs, compared to these same questions of wants in the past? Anthony: I want people to be able to see how dedicated we are and that we have no delusions of grandeur. We do this because we love it. We aren’t in this to be rock stars, only to shake things up and play the music we love to create. Kevin: I feel personally my songwriting has changed a lot, Towards the “End” of ColorBlind I was very much into big theatrical parts with lots of harmonies and overdubs, whereas now I feel like i’m much more into writing heavier songs that make you wanna move. Kira: Let’s talk about “20,000 Leagues Below The Sea.” Clearly there’s a loss at hand and lots of drinking away an obviously deep-seeded void. Who’s personal experience is being shared with the world here? Would you mind sharing some of insight and reflection behind it? Kevin: It’s certainly my personal experience. My roommate had a 20,000 leagues under the sea poster that was right next to the entrance of my room and its one of my favorite novels so it was kind of always in the back of mind. I don’t think anyone actually knows this but I actually wrote the lyrics one night when I was really trashed with my friend Leanna McNaughton at Portside [Bar & Grill], who we have since lost. I was going through a bad breakup and just wanted to get trashed every night. Just felt like I was drowning and kinda lost at sea. When you breakup with someone you kinda need to learn how to be a person on your own again. Like the person you normally would text and tell you saw something funny or saw a cat or wanted to know if they wanted to get food now you can’t anymore. You’re pleading with the world like just “Talk to me” or just listen. The whole album really is a kind of breakup concept album but more from the side of someone who fucked up a relationship and didn’t realize what they had until it was gone and now they have to deal with that and have to forgive themselves more than anything. Kira: Kevin, I mentioned in my review above, quite a few small but significant moments where the track throws some melodic loops and keeps things from settling into a cruise control mentality. Talk a little about writing the tune for this song. How did it come together and were you making a dedicated effort to avoid total certainty in the composition? Kevin: The song actually started as an acoustic song. I had always liked the song but couldn’t figure out where to go with it. The song actually didn’t really start to come together until we started recording. I had always imagined the song as someone drifting out in the ocean and as the song builds up the waves the rougher and you’re swirling around fighting to stay afloat. I’m not musically trained so I definitely didn’t go into the song thinking like “Oh well I played a D so now I need to go here” It was really just a matter of getting it out of my head. Kira: What’s one memory of major substance that occurred during your time working on the album at VuDu Studios? Was it a moment during recording? Mixing? Play back? Since listeners doesn’t get to be in the control room with the engineer when those kind of things happen, it’d be great to know what your apex moment was. Anthony: The groove and the gear felt right as soon as we walked in. I remember hearing the drums for the first time when we started recording and realizing this wasn’t a “Bedroom Record” but was going to be a record with real substance. Eric: My memory is the night I came in to record the screaming vocals for “Redshirts.” It was actually the only time I was there since I joined close to the completion of the album, but awesome none the less! Kevin: I think my favorite moment was when we started to do vocals. Tracking was taking long than we had expected and we were starting to get discouraged, I remember I came in very very ill and was in the vocal booth with a bucket next to me incase I needed to throw up(I later needed to get my gallbladder removed). We did the vocals for Grace Under Pressure(Which is not an easy song to sing) and we had done a bunch of crazy harmonies on it and I remember listening back and thinking that we were really making the album we had dreamed of. When you walk into a studio for the first time and the first person you meet is a baby kitten you know it’s gonna be a great time! Kira: Where do you see Like Minded Criminals in a year? What’s the first big goal on the horizon for this trio? Anthony: I see us on tour somewhere. My goals would be spend more time on the road than at home. My favorite place is on the road with the band. I would like to meet cool people and see all the amazing things that the world has to offer. Eric: I also have dreams of extensive touring. I want to spread the energy of our performances, and promote our new album, and new band as far as possible. To see all different people from all different backgrounds come together to get rowdy and have a great time, especially now that society is becoming so divided. Kevin: I would love to see us on the festival circuit I think. All in all I think I just wanna play loud rock music with my best friends and jump off drum sets. Kira: And now for the potpourri portion of the conversation: What are each of your favorite pieces of musical gear? Why? Anthony: I would have to say the kick drum on my Custom Ludwig kit. It’s a 24×18 classic maple with red sparkle finish that I had custom made by Ludwig for me and it’s just the kick drum sound i’ve been chasing in my head for years. Kevin: I would have to go with my Ampeg V-4b head. It’s actually normally used as a bass head but I think for guitar it really gives that low-end that sometimes is hard to get out of a standard guitar amp. It’s really the cornerstone of my tone in general, I just plug in and crank it. Its 100 Watts of pure bass amp goodness, Shout out to Omar Alui for giving me the hook up at guitar center! Eric: My two favorite pieces of equipment would have to be my Fender Jazz bass named MoonSugar, and my OCD overdrive pedal. The combination of the classic thumpy sound of the jazz style pickups paired with the explosive distortion from the OCD truly defines my sound. 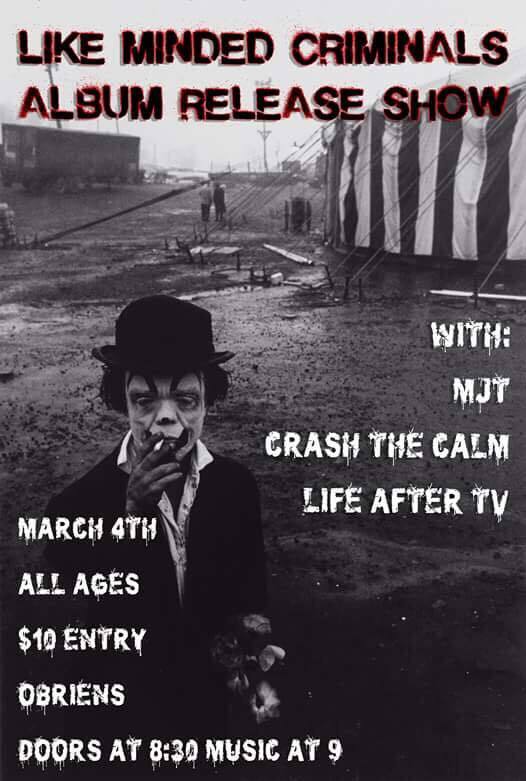 Catch the Like Minded Criminals at their album release party, this Saturday, 4 March 2017. Full show details are below. 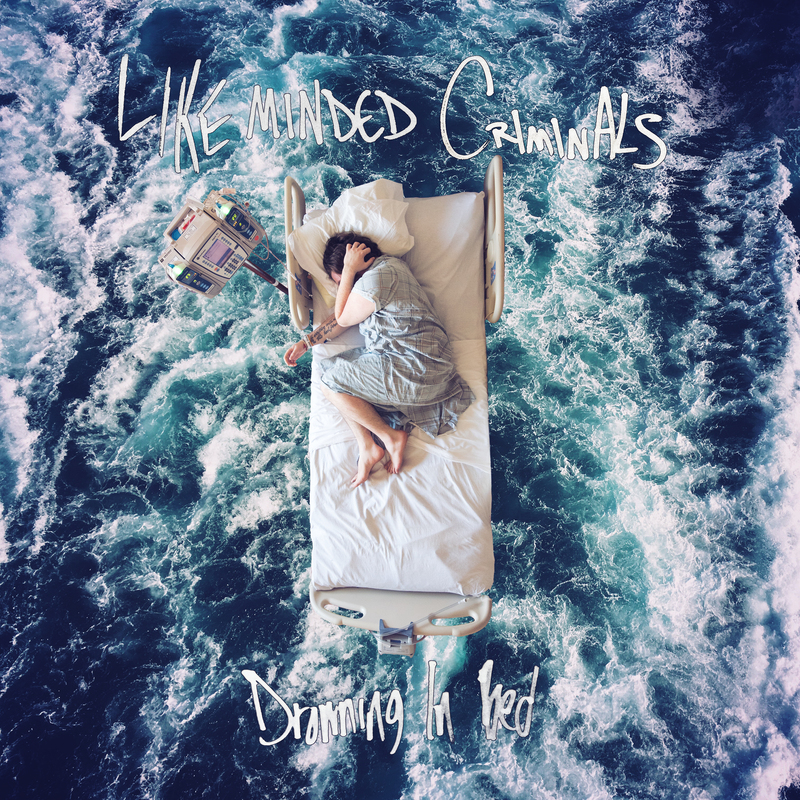 Like Minded Criminals Album Release Party!